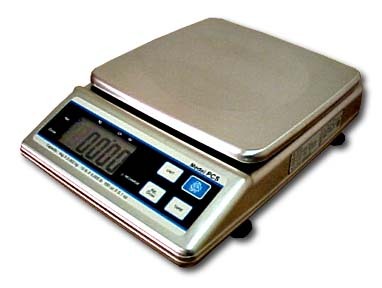 The PCS series is a Legal for Trade heavy duty stainless steel portion control scale. It comes standard with a large easy to read 1.0" high 5 1/2 digit LCD display and is available in 4 lb, 10 lb, 20 lb and 40 lb capacities. Weighing units are lb, kg, oz & lb:oz (lb:oz must be disabled for NTEP use). The PCS series is powered by an internal rechargeable battery or an AC adapter (included). The internal rechargeable battery provides 72 hours of continuous use. Battery life will be extended if the auto shut-off feature is used. Platform size is 8.5" x 8.5". Five built-in overload stops and one underload stop. The PCS comes equipped with an RS232 serial output for use with a printer, computer or remote display. The output can be set for continuous data transmission or on demand printing when the ZERO key is pressed. Available baud rates are 2400, 4800, 9600 and 19,200.